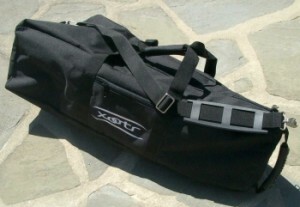 The Xootr carry bag allows you to transport your scooter comfortably and securely. It is tailored specifically to fit your scooter plus a few other items such as a helmet, lock, lunch, etc. It is made from 600 denier coated Cordura® Plus nylon for durability. There are 35mm web handles wrapped around the bag for added strength. 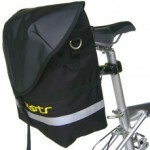 A heavy duty grab handle at one end aids you in carrying the bag in tight quarters. A clip-on shoulder strap attaches to metal D-rings on each end and self-repairing 2-way YKK nylon coil zippers round out this exceptional bag. Click here for a video on how to pack your Xootr scooter!